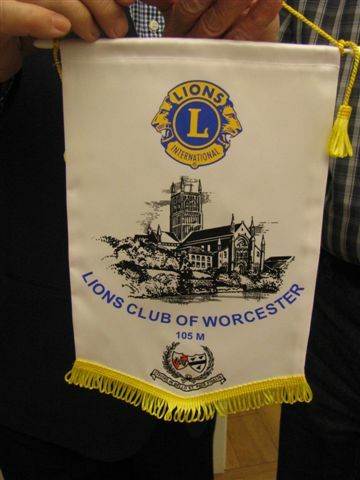 In 2010 Worcester Lions started fundraising for a joint project with our twinned Lions Club in Orleans Doyen, France plus the Ladies Lions Club of Kathmandu Bhrikuti. 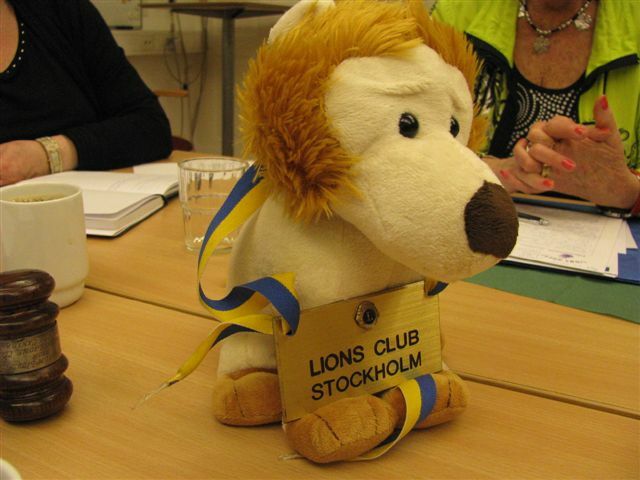 We also had a large donation from Sheldon Lions. 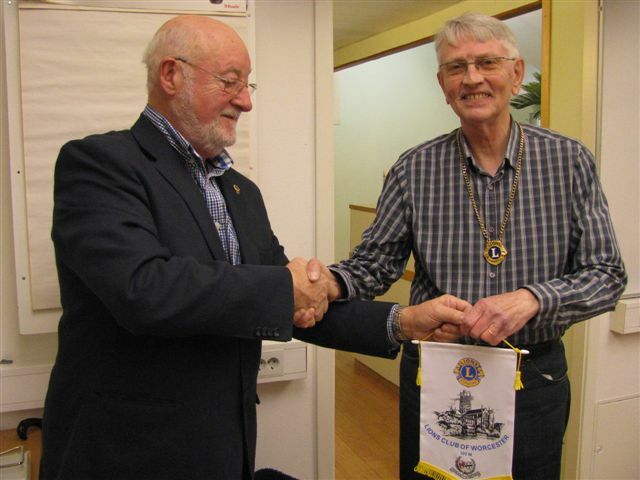 The total amount that was raised was nearly £9,000. 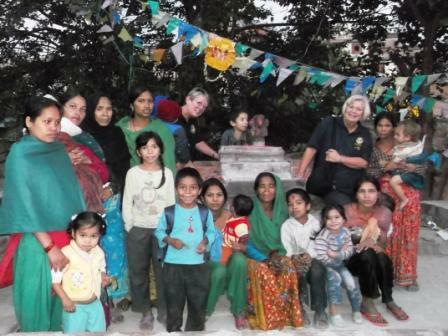 In October June Lloyd-Adams and Janet Long went out to Kathmandu in Nepal to see how the project was getting on. 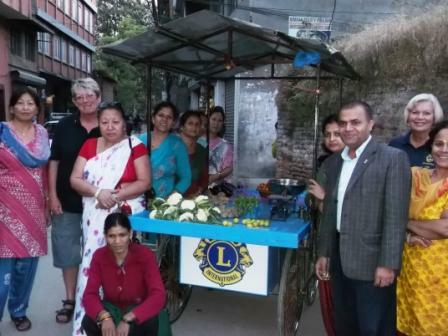 Set up a vegetable cart scheme that would assist 26 women currently living in a slum in Dallu area of Kathmandu with 64 children to enable them to work, earn money and thus feed, clothe and educate their children. This would give them a chance to re-form family life, become self-sufficient and regain their self respect and hopefully be able to move to better accommodation. We are pleased to report that the project that was started two years ago is now reaching its final stage! Following on from the pilot in autumn 2011 enhanced carts were designed with a canopy and storage under the cart capable of holding 35 kilos of vegetables. We observed the new carts in action in October 2012 and looked at the savings scheme set up to monitor the women. The carts are working very successfully and it was with a great deal of pride that we saw how good the 10 carts looked prominently displaying the Lions symbol plus the Lions Clubs that involved. It was great to see how well the vegetables were selling. As there had not been enough money raised to buy a vehicle it had been decided to purchase the vegetables directly from a wholesaler. This seems to be a good option as there are no vehicle maintenance charges involved and although there is slightly less profit on the vegetables it is an easier option. All children are now in education. Students from the university have trained all the women in basic skills, management of money, basic book keeping, weights & measure, food hygiene etc. The project will be run by Bishwa from Happy Home Orphanage and the university students on a day-to-day basis and be overseen by the ladies of the Lions Club of Kathmandu Bhrikuti. We are pleased to report that no further money is needed to complete this project. A big thank you to everyone that has supported this project - you should be very proud of what has been achieved. It is amazing what can be achieved by Lions from 3 different countries working together. 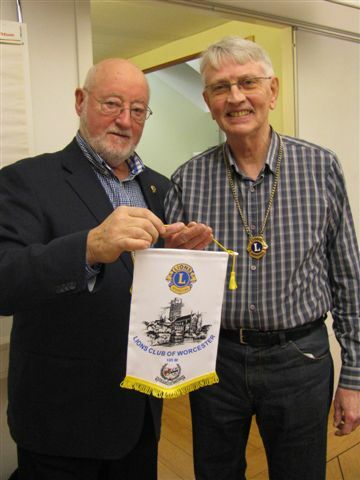 On the occasion of the fortieth anniversary of their twinning, Worcester Lions Club met with Orleans Doyen Lions for a weekend in Normandy and Brittany. 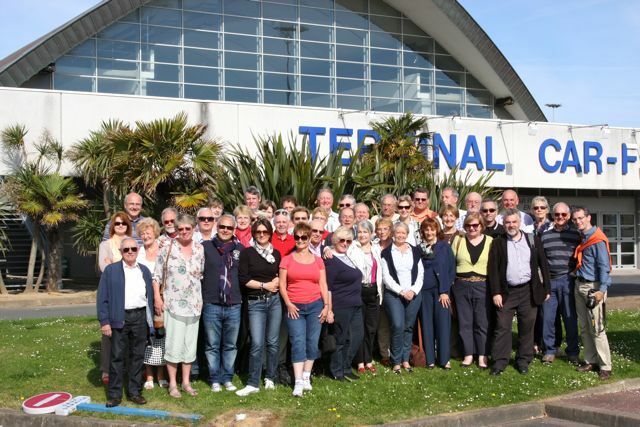 Twenty-one Worcester members and their partners met in Poole for a warm up dinner prior to crossing to Cherbourg on Saturday 26th May. There we were met by our hosts, who had planned an entertaining day and a half of activities. 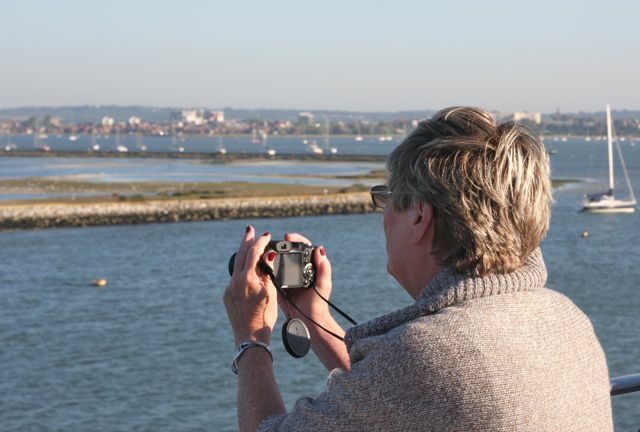 We started at a marine museum in Cherbourg, where we were shown round a nuclear submarine. 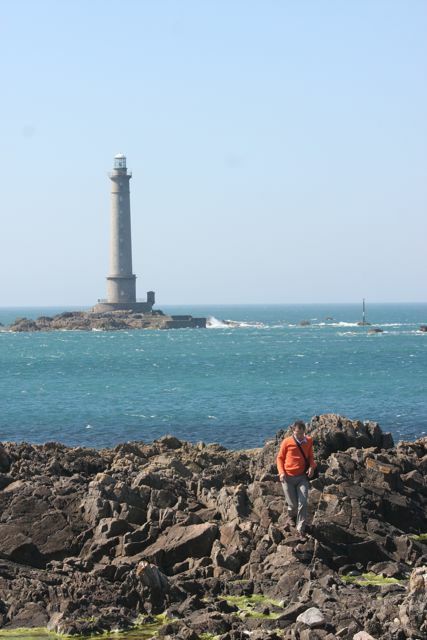 After lunch, our coach took us to the coastal beauty spot of Cap de La Hague where we were able to wander around the rocks with views out to Alderney. 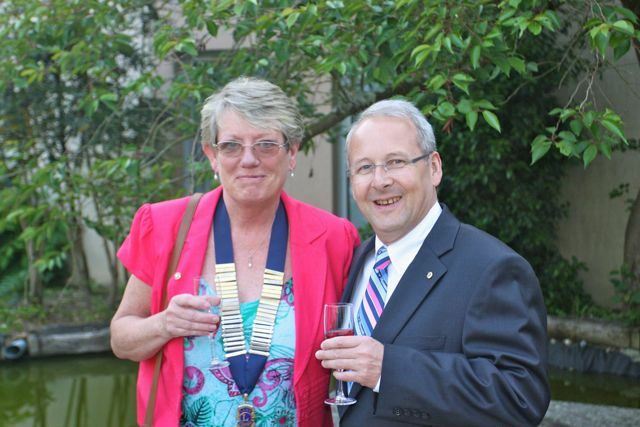 Then it was on to our hotel in Coutances, for a gala dinner. 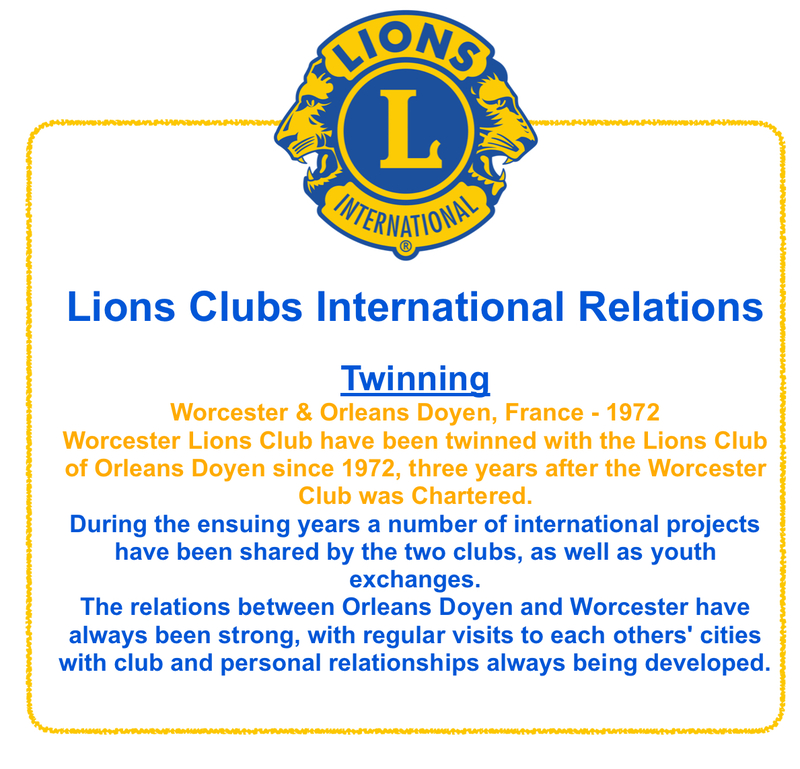 Club presidents Janet Long and Dominique Ugarte spoke of the close relationship between our clubs dating from 1972. 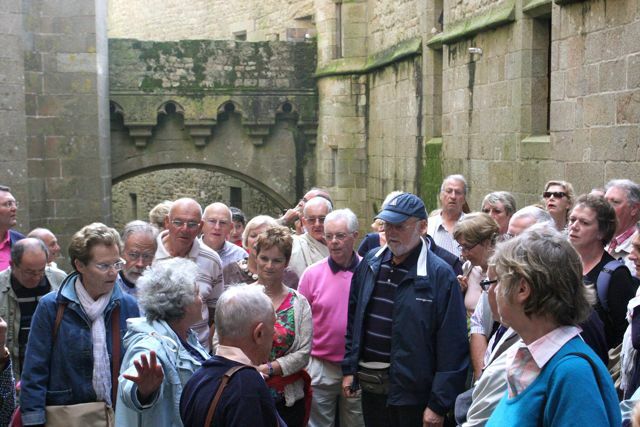 Orleans took us down memory lane with photos of past exchange visits. 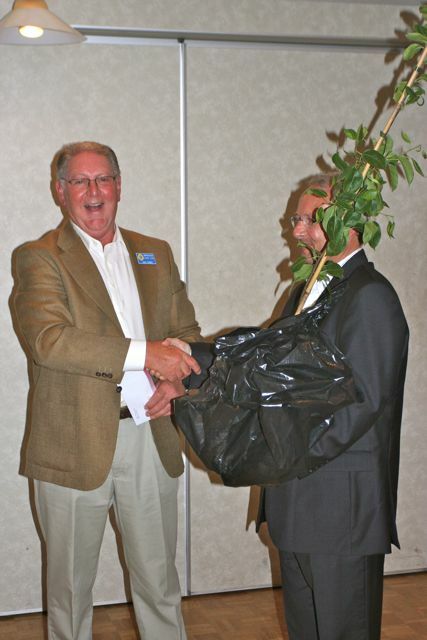 Lion John Turner presented Orleans Lions with a black pear tree to commemorate the visit along with gift books on the history of Worcester for each Orleans member present. 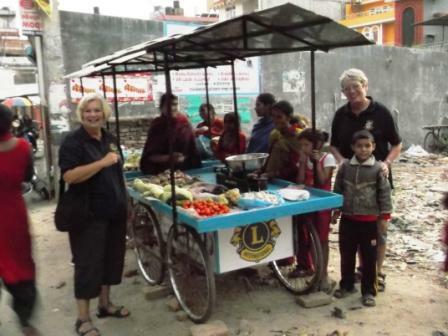 And Lions June and Trevor Lloyd-Adams gave an update on the Dallu project, a shared fund raising effort which had recently resulted in the advance of money to purchase a truck to assist the trading efforts of the women street vendors in Katmandu. 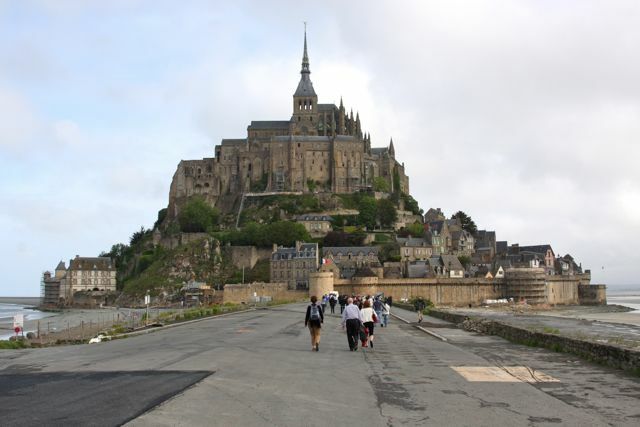 The next day we started early for Mont Saint-Michel and a tour of its Abbey there. This was followed by a visit to an Oyster farm, tasting included. 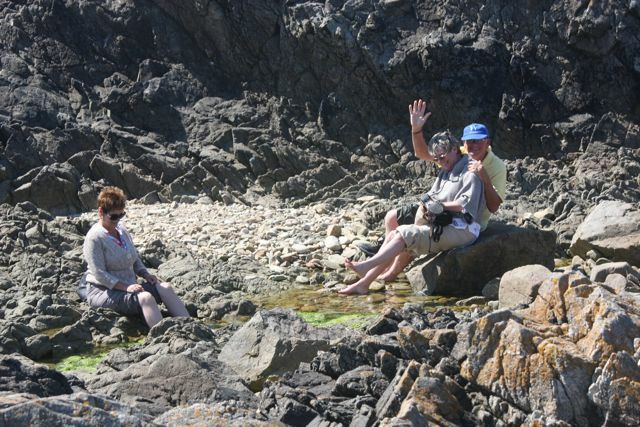 We then wound up with some free time in the port of St Malo before returning to our hotel. It was again an early morning call on Monday for the coach ride back to Cherbourg and our “au revoir” to our Orleans friends. Our warm thanks go to them for their generous hospitality and a wonderfully organized trip. 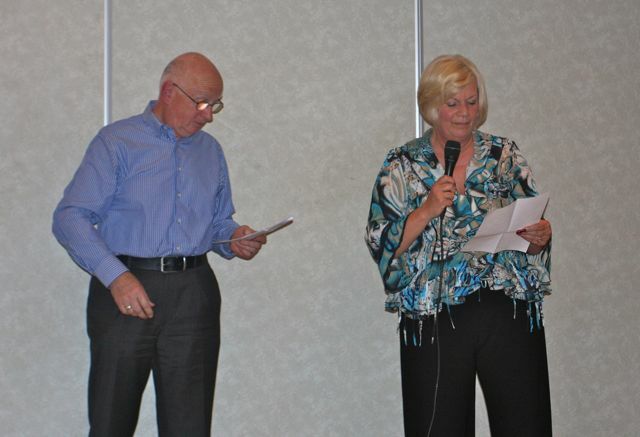 Lions Trevor and June Lloyd-Adams, spent 3 weeks last October as volunteers in Happy Home orphanage in Nepal and declared it “a life-changing experience”. Happy Home is a NGO run by a Nepali man, Bishwa, who has made it his ambition to see all the street children in Kathmandu taken off the streets and given the chance of a better life. This picture shows the 20 children from Happy Home on a day-outing to see the sunrise over the Himalayas. As can be seen here, these children are among the lucky ones: they are well-fed, clothed and happy and lucky enough to attend a good private English speaking school. But all of this relies purely on donations from people around the world – there is no government scheme to assist this work. There are estimated to be 2000 street children in Kathmandu, mainly due to the ten years of civil unrest which has left women without a bread winner and no home. For the majority of these abandoned children the future is dismal and many turn to substance abuse (often glue sniffing) and begging to get through their daily misery. It has been said that they are simply waiting to die. Lions Trevor and June had a wonderful time with the children from Happy Home and were able to supply the children and the orphanage with many necessities thanks to the donations they received from Lions and friends and family. They are determined to return to Nepal and are now in the process of starting up another project that will help single mothers to find employment so that they can feed and, hopefully, educate their children. The children enjoying a picnic lunch - they ate everything on the plate!